Are you interested in TNPSC Recruitment 2019? If yes then you can check notification from here. 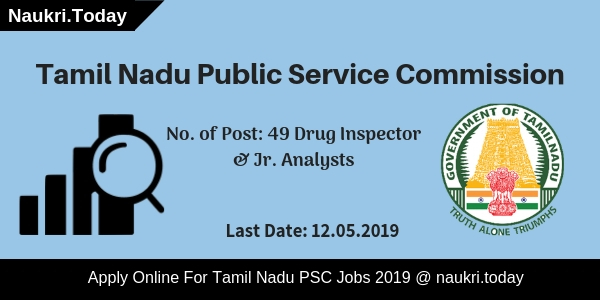 Tamil Nadu Public Service Commission is inviting the eligible applicants to apply for TNPSC Drug Inspector Recruitment 2019. There are 49 Drug Inspector & Jr. Analysts Vacancies are available in the department. The Starting date of the online registration process will be 12.04.2019 for TNPSC Vacancy 2019. The Due date of filled application form is going to be 12.05.2019. Applicants who consist of Pharmacy/Chemistry/Pharmaceutical Chemistry Degree can also fill the application form. You can below mentioned article which contains complete details of Tamil Nadu PSC Jobs 2019. What Are Frequently Asked Questions For TNPSC Drug Inspector Recruitment 2019? Check Here TNPSC Junior Inspector Vacancy 2018 Details. Education Qualification for TNPSC Drug Inspector Vacancy Applicants can contains degree in Pharmacy/Chemistry/Pharmaceutical Chemistry from any recognized university. Candidates can deposits the application fees through online mode which is Debit Card, Credit Card or Net Banking or SBI Challan. How To Fill Online Forms For TNPSC Jobs 2019? Eligible candidates can press Apply Option. Attach the colored passport size photo & signature in the form. Recheck the Tamil Nadu PSC application form once again. Take out the print of application form once again. Conclusion: TNPSC Recruitment 2019 notification is uploaded on its official website for 49 Drug Inspector & Jr. Analysts Jobs. Candidates can fill up the application form for TNPSC Drug Inspector Jobs 2019 before the last date which is 15.05.2019. Tamil Nadu Public Service Commission is inviting applications for TNPSC Recruitment 2019? Department has issued notification for 60 Assistant System Engineer & Analyst Posts. Online registration for TNPSC ASE Vacancy had taken place from 22.01.2019. Participants should submit their online application form on or before 20.02.2019. Candidate have to pay Rs.150/- as registration fee for Tamil Nadu PSC Jobs 2019. Additionally, aspirants need to pay Rs.200/- as examination fee for TNPSC Assistant System Engineer Jobs 2019. For further more details candidate must read the given article carefully. Fresh Update as on 13.02.2019: Dear Participants, TNPSC has issued notification for 60 Assistant System Engineer & other Posts. Candidates may apply online for TNPSC Recruitment 2019 before the last date. Here we gave you complete eligibility criteria details. Fresh Update as on 02.02.2019: Candidates who want to apply online for TNPSC Recruitment can fill application form till 20.02.2019. Before applying participants can check TNPSC ASE Vacancy Notification 2019 from the link given below. Candidate can apply from the direct link given here. Here participants can check more details regarding TNPSC Recruitment 2019. Department have given some eligibility parameters for Tamil Nadu PSC ASE Vacancy 2019. Applicants can collect all information from the table as given below. For more details regarding eligibility criteria candidate must check TNPSC ASE Jobs Notification from the link given below. Yes, TNPSC department is providing fee concession to Reserved Category candidates. Participants can check detail information for TNPSC Recruitment examination fee in below section. For further more details applicants may check TNPSC Notification from the link given below. Candidates must have completed at least 21 years to get eligible for TNPSC ASE Vacancy 2019. Similarly, for TNPSC Jobs participants should not have completed 30 years. Age will be considered as on 01.07.2019 for Tamil Nadu PSC Recruitment 2019. Here age relaxation scheme is also applicable by the department. Applicants can check age criteria from below section. Firstly, Candidate should log on to official website i.e. tnpsc.gov.in. Then go to homepage & search for TNPSC Jobs notification. Eligible participants should click on “Apply Online” link. Fill all the personal details required in TNPSC ASE Vacancy Online Form. Then Upload your recent passport size photo & signature in the application form. Recheck all entries filled by you in TNPSC Recruitment Form. Then make payment of application fee. Afterward, click on “Submit” button. Participants can also take print out of application form. Conclusion: Tamil Nadu Public Service Commission has issued Notification TNPSC Recruitment 2019. Department has released notification for 60 Assistant System Engineer & Analyst Posts. Applicants may apply online for TNPSC ASE Jobs 2019 before last date i.e. 20.02.2019. TNPSC Exam will take place on 07.04.2019. Hello Friends, Are you looking for jobs in Tamil Nadu? If yes then here is a very great opportunity for you. Tamil Nadu Public Service Commission is inviting applications for Assistant Agriculture Officer. Total of 580 seats is available for TNPSC Recruitment 2019. Participants who are eligible and interested can apply through online mode. Registration for TNPSC AAO Jobs 2019 is starting from 27.12.2018. The last date to submit application forms is 27.01.2019. Before filling application form applicants must check the selection process, eligibility criteria for TNPSC Assistant Agricultural Officer Vacancy. For furthermore details candidate must read the given article carefully. Post Name and Code No. Candidates who going to apply for TNPSC Recruitment 2019 must fulfill some eligibilities for Assistant Agricultural Officer Posts. Here some eligibility parameters are set by the department. To get rest of the information regarding eligibility criteria of TNPSC AAO Jobs 2019 applicants must read below section. Participants who are applying for TNPSC Jobs 2019 must check the education qualification required by the department. Here we are providing you information related to required education for TNPSC Assistant Agricultural Officer Jobs 2019. Applicants who are filling application forms must have passed Higher Secondary Examination from any recognized board. Candidate should also have Two years Diploma in Agricultural field from any institute which is affiliated by Tamil Nadu Government. For more information aspirants must check TNPSC Notification from the link given below. Applicants who are going to apply for TNPSC Recruitment 2019 must have a minimum age as 18 years as on 01.07.2018.. Participants should not have completed 30 years to become eligible for TNPSC Vacancy 2019. Here the upper age relaxation scheme is also applicable by the department. Participants who belong to SC/ ST/ MBC/ DC/ BC/ BCM/ DC caste are not having an upper age limit for Tamil Nadu PSC Vacancy 2019. For more details relevant to age criteria candidate must read TNPSC Notification from the link given at the end of the article. The organization will going to take written examination for candidates who have filled TNPSC Application Form. Written examination will have two parts i.e. Paper I & Paper II. Organization will held Paper I & Paper II for TNPSC Recruitment on 07.04.2019 in two different Shift. Final selection will be on the basis of marks obtained in written exam. For more details related to selection process applicants may refer TNPSC AAO Vacancy 2019 notification. Department will pay great salary package to the candidates who have selected for TNPSC AAO Recruitment 2019. Participants will get paid Rs.20600/- per month as minimum salary for TNPSC Jobs 2019. Aspirant will get Rs.65500/- per month as their stipend. 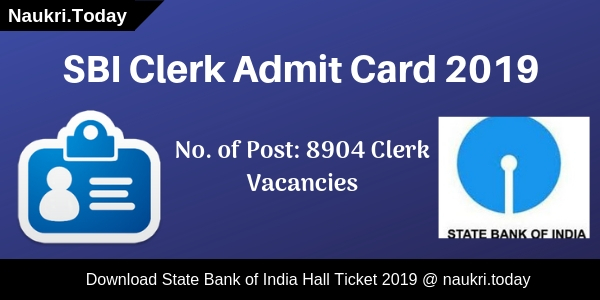 For rest of details regarding pay band you should refer Tamil Nadu PSC Vacancy 2019 notification. Applicants can also download TNPSC Notification either from here or from official website. Applicants who are going to fill online form have to pay registration fee for TNPSC Recruitment 2019. Candidates have to pay Rs.150/- as application fee & Similarly, Rs.100/- as examination fee. 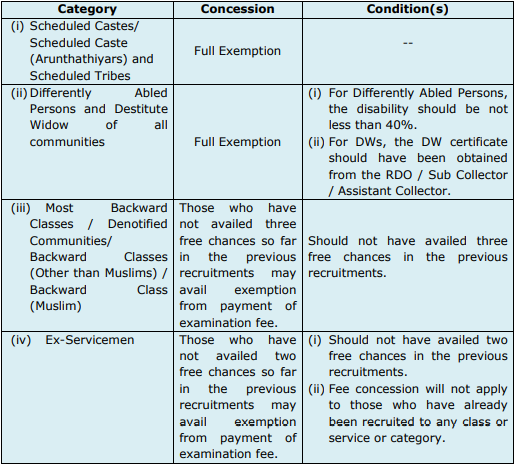 Participants of Reserved Category/ SC/ ST/ PWD/ Widows of all category are exempted from payment of application fee. Last date for make payment of Tamil Nadu PSC Jobs application fee is 29.01.2019. Payment of fee must done through Debit Card, Credit Card or Net Banking. Aspirant can also pay fee through offline mode through E Challan. For more information regarding application fee you must check TNPSC AAO Vacancy 2019 notification from the link given below. Candidate who wish to fill online application form must apply online between 27.12.2018 to 27.01.2019. Late application forms will not be accepted by the department. Applicants should fill registration form very carefully, if any mistake found in online form will get rejected by the department. Here we are providing you some easy steps to follow while filling registration form for TNPSC AAO Recruitment 2019. Firstly, participants must log on to official website i.e. tnpsc.gov.in. Then go to homepage & search for TNPSC AAO Jobs 2019 notification. Read all the information given in notification carefully. Afterward, eligible candidates should click on “Apply Online” link. Fill all the details in the application form correctly. Upload recent passport size photo & signature in online form. Then recheck all the details filled by you. Make payment of application fee for TNPSC Recruitment. Afterward, click on the “Submit” button. Finally, applicants can also take print out of application form. Conclusion: Tamil Nadu Public Service Commission has issued notification for 580 Assistant Agricultural Officer posts. Candidates who are interested must apply for TNPSC Recruitment 2019. Applicant must fill online application forms between 27.12.2018 to 27.01.2019. Tamil Nadu Public Service Commission has issued notification for the Post of Assistant Engineer, Assistant Director, and Other Posts. There are 41 vacancies are available for TNPSC Recruitment 2018. Interested and eligible participants may fill up their application form from here. Registration for Assistant Engineer vacancies has started from 26.11.2018. Candidates should fill up their application form before last date 24.12.2018. For more details regarding TNPSC Vacancy 2018 read below article carefully. Here we provided you eligibility criteria information for TNPSC AE Jobs 2018. Before apply for TNPSC Jobs 2018 candidates must check below section carefully. Eligible Applicants may fill up their application form from links given here for Tamil Nadu PSC Vacancy 2018. Participants should have Engineering Degree or Technology from any recognized university or any Institution under AICTE. Candidates must have workshop or factory experience nit less than three years for TNPSC Recruitment 2018. The form further more information candidates should read official TNPSC Notification 2018. The Department has set a different minimum age for both vacancies. Candidates who are going to apply for Assistant Director training Post must be 24 years is the minimum age for them. And For Assistant Engineer Post 18 years is the minimum age for TNPSC Jobs 2018. Candidates may download TNPSC AE Notification either from here or from the official website. The Department may inform that the maximum age of applying candidates for both vacancies is not more than 58 years. Applicants need to pay their application fee in two parts for TNPSC Recruitment 2018. In Part, I Candidates will pay Rs. 150 for one-time registration. The One Time Registration is valid up to 5 years only if the applying candidates has already registered they need not to pay a registration fee. The Examination Fee is compulsory for all applicants either they registered or not. The Amount of examination fee is different for both categories. Candidates who apply for Assistant Engineer Post they will Rs. 150/- but participants who applied for both post will pay Rs. 200/-. For more information consult to official notification of TNPSC Bharti 2018. Selection of Candidates will take place in three stages such as Paper I, Paper II and Interview. Both Paper I & II should be conducted on the same date which is 02.03.2019. Participants who qualify in written examination will call for Interview. Merit List of Selected candidates should be created on the basis of overall marks of both exams. Here we provided you links to download TNPSC Recruitment 2018 Notification. the Department will pay salary to the selected candidates on the basis of Level 20 & 22. Participants who get select on the Post of Assistant Engineer will get Rs. 37700 – Rs. 119500/- and for the Post of Assistant Director will get Rs. 56100 – Rs. 177500 for TNPSC AE Recruitment 2018. Aspirants must apply online before the last date has passed for TNPSC Jobs 2018. Aspirants should follow these steps to apply for Tamil Nadu PSC Jobs 2018. Participants may download TNPSC AE Notification either from here or from official Website. Log on to Official Website of Tamil Nadu PSc i.e tnpsc.gov.in. Search for recruitment section at Homepage. After that read the complete notification carefully. Eligible applicants may fill up their application form from here. Conclusion: Tamil Nadu Public Service Commission has issued notification for 41 Assistant Engineer Vacancies. Candidates should check here eligibility criteria for TNPSC Recruitment 2018. Here we gave you links to apply online for TNPSC AE Jobs 2018. Are you seeking for TNPSC Recruitment 2018? If yes, there is a good news for you. Tamil Nadu Public Service Commission has published notification for 53 Draughtsman Vacancies. Interested participants should check here eligibility criteria for Grade III Vacancies. Online Registration is going to begun form 30.10.2018. eligible applicants may fill up their application form before last date 28.11.2018 for TNPSC Vacancy 2018. Aspirants who are going to apply for TNPSC Grade III Jobs should be physically fit. Here we gave you complete details regarding Tamil Nadu PSC Draughtsman Vacancies. Participants should check here Tamil Nadu PSC qualification, age, and application fee required for TNPSC Recruitment 2018. Before applying candidates should check here eligibility criteria for Tamil Nadu PSC Draughtsman Vacancy 2018. Applicants should enter details correctly in application form otherwise, their form will be rejected. Here we gave you links to download TNPSC Notification 2018. Candidates should have Post Diploma in Tower and Country Planning from a recognized university of government of India. Participants should not need any experience to apply for TNPSC Jobs 2018. Applicants may also consult all the details from Tamil Nadu PSC Notification 2018. Applicants must have a Diploma in Civil Engineering, and Architectural Assistantship from the State Board of Technical Education and Training for TNPSC Draughtsman Recruitment 2018. Candidates who have these qualifications may also require 3 years of experience to apply for Grade III Posts. For further more details aspirants should check Draughtsman Notification. Aspirants of general category should not more than 30 years of their age are eligible for TNPSC Jobs 2018. The Department has provided 5 years of age relaxation to the SC/ST/MBCs/DCs/ BCs/BCMs.Widows of all caste. Here we gave you table which gave you details about age relaxation. Candidates need to pay Rs. 150 as registration fee and Rs. 150 for an examination fee. Candidates who have register before need not to register again for TNPSC Jobs 2018. One Time Registration is valid for up to 5 years only. Participants can pay their application fee through online mode as well as offline mode. Candidates may use their Net Banking, Debit Card, Credit Card for the payment of examination fee. Aspirants should download Tamil Nadu PSC Notification either from here or from the official website. Candidates should be selected in two stages such as Written Examination and Oral Test. Candidates firstly appear for written examination which is going to held on 03.02.2018. A written examination should be objective in nature. An examination will be conducted at various centers. The Three Main Center are Chennai, Madurai, and Coimbatore. A written examination should be divide into two parts: Paper I & Paper II. Time Duration of Paper I is 3 hours and Paper II is 2 hours. Candidates who qualify in the examination will take part in Oral Test. Final Merit List should be created on the basis of both test marks for TNPSC Recruitment 2018. The Department will pay salary according to Level – 11 for Draughtsman Posts. Candidates will get their salary of Rs. 35,400/- to 1,12,400/- for TNPSC Jobs 2018. For further more information applicants should check official notification carefully. Here we gave you links to apply for Tamil Nadu PSC Recruitment 2018. Candidates should follow these steps to download TNPSC Draughtsman Notification 2018. Here we gave you complete details regarding Tamil Nadu PSC Jobs 2018. After that may search for TNPSC Recruitment section at Homepage. After that eligible candidates may apply online from here. Applicants should fill up their application form correctly. Now insert your passport size photo and signature in form. Click on Submit button to Save it. Conclusion: Tamil Nadu Public Service Commission has issued notification for 53 Draughtsman Vacancies. Candidates should check here qualification, age, and application fee for TNPSC Recruitment 2018. TNPSC Recruitment 2018 – Tamil Nadu Public Service Commission has issued notification for Direct Recruitment on Junior Inspector Vacancies. There is 30 Vacancies are available in CO-Operative Department. Interested applicants may apply online for Group –III A Service Post on or before 21.11.2018. Participants should fill up their application form from 23.10.2018. Before applying for TNPSC Jr. Inspector Vacancy 2018 candidates should check either he/she fit in eligibility criteria or not. Candidates who have Higher Secondary Course or Pre-University Examination Degree are eligible for Junior Inspector Post. Aspirants should be between 18 years to 30 years can apply for TNPSC Jobs 2018. The Department has provided 2 years of age relaxation to MBC/DC/BC and BC (Muslims) or 5 years to SC/ST/PWD Category Participants. Applying candidates need to pay Examination Fee as well as Registration Fee For Tamil Nadu PSC Recruitment 2018. Applicants can pay their both fee through Online Mode. Candidates should pay Rs. 150/- as Registration Fee and Rs. 150/- As Examination Fee For Junior Inspector Posts. Last Date for the Payment of Application Fee is 23 November 2018 through Bank (State Bank of India & Indian Bank). Tamil Nadu PSC will select candidates on the basis of their performance in written examination and Oral Test. The Department will conduct written examination tentatively on 27.01.2019 for TNPSC Recruitment 2018. A written examination will be held at different centers. Total Marks of written examination is 120 Marks. The Department pays a good amount of salary to the selected candidates. Applicants will gain their salary on the basis of Level 10 which is Rs. 20,600/- – Rs. 65,500 Per Month.Participants should apply online either from here or from the official website. After filling up application form aspirants may not forget to note down ID Password and Registration Number for TNPSC Jr. Inspector Jobs 2018. For further more details candidates should read official TNPSC notification carefully. Here we provided you links to download TNPSC Vacancy 2018 Notification. Applicants should log on to the official website of Tamil Nadu PSC i.e tnpsc.gov.in. After that click on TNPSC Recruitment Section at Homepage. Now read the complete notification carefully. Eligible Candidates may apply online for TNPSC Jr. Inspector Vacancy. Interest required details in an application form. Conclusion: Tamil Nadu Public Service Commission has published notification for 30 Junior Inspector Vacancies. Candidates may apply online form links given here for TNPSC Jr. Inspector Vacancy 2018.